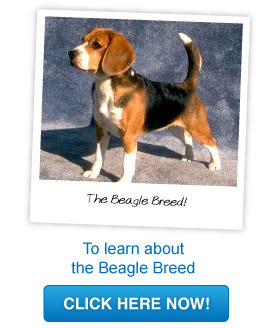 With their cute floppy ears and easy nature, the beagle breed is a popular choice of pet. Read on to find out more about the adorable beagle breed! Beagles have been around since the 1500s. They were breed to hunt – Englishmen would take packs of beagles out to chase small animals including rabbits and pheasants among many others. Beagles still have their hunting tendencies today, so it is important to train your beagle how to behave correctly around small animals. Beagles have since become one of the most popular choices of dogs due to their cute appearance and happy nature. And of course, everyone knows the ‘world’s most famous beagle’ Snoopy, which also made the beagle breed popular! Beagles are medium in size and are squarely built. They have a domed long skull, medium length nose, adorable doe like eyes and cute floppy ears. The beagle tail is set high and it can’t curl around. Beagles come in many colors including lemon and white, white and orange, white, lemon, red, tan and black. Their bark does not sound like a normal dog bark, instead it sounds like a loud cry or even a howl. A male beagle will grow in height to thirty six to forty one centremetres and weigh ten to eleven kilograms. A female beagle will grow in height to thirty three to thirty eight centremetres and will weigh nine to ten kilograms. Beagles are a very popular dog due to their size and easy nature. A beagle will easily fit into your family as they are very loving and gentle – excellent for families with children. When training your beagle it is important to be patient as they can be stubborn and have a mind of their own. As previously mentioned, beagles were breed as hunters, therefore when your puppy is young it is best not to trust them with small animals such as cats. You need to train your beagle around these animals before you can leave them alone with them. An important thing to note about a beagles personality is that due to their hunting nature they have a strong sense of smell. They love to sniff! They will pick up a scent and then they are off. They often they will not come back even if you call them. Due to this curiosity it is important not to let your beagle off a leash unless you are in a safe area. Overall a beagle’s personality is very fun, easy going and they will make a great member of any family. However, remember beagles have a stubborn side so it’s important to take the time to properly train your beagle. Beagles are mostly healthy dogs. However some lines of beagles can develop epilepsy or eye and back problems. Although these problems are rare, it is still important to have regular checkups at your local vet so you can treat your beagle straight away if anything does occur. Beagles enjoy being outside, therefore it will be a benefit if you live somewhere with a backyard (it doesn’t have to be ginormous). However, if you do live in an apartment or don’t have a backyard then just make sure your take you beagle on regular walks. Beagles need exercise every day. You can do this by introducing a set time for their daily walk. By walking your beagle every day you will lessen the chance of them developing obesity. A beagle’s life expectancy is approximately twelve to fifteen years. A beagles litter can range in size from two puppies to fourteen. However, the average is seven. A good thing about a beagles coat is that it’s smooth, short and straightforward to look after. The best way to groom your beagle is with a firm bristled brush. Due to beagles having large floppy ears, moisture can build up inside. Check your beagle’s ears regularly to make sure they don’t get an infection. If your beagle does an infection in their ears then make an appointment with your local vet. It is also important to cut your beagles nails on a regular basis. Due to their happy and easy going nature, the beagle breed will fit well into any family. Although they do have a stubborn side, this shouldn’t become a problem if you train your beagle well. The beagle breed will make an extremely loyal pet. That’s why we love beagles! !